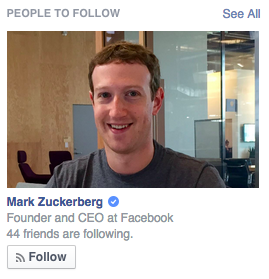 who to follow (AKA people to follow or recommended users) is a feature on a site that suggests people or other accounts to follow, likely using a recommendation engine. Prior independent examples of an early but limited type of this functionality can be seen in the early use of blogrolls. For some ideas and prior artwork, see also blogroll#Brainstorming. 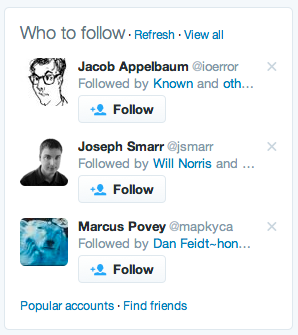 Twitter shows a "Who to follow" box in the sidebar when logged in and viewing someone else's profile. E.g. Here's a screenshot of Kartik Prabhu's "Who to follow" page on Twitter. Note Twitter shows only specified full names in the "Followed by ..." text. This can look interesting when users change their display name for various reasons, e.g. the "⚡️" that is a reference to David Bowie. This page was last edited on 11 May 2018, at 21:30.